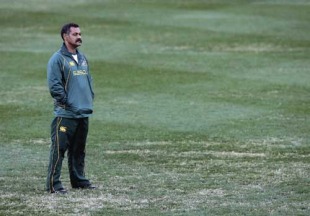 Peter de Villiers faces censure from SANZAR over his conspiracy theories surrounding South Africa's Tri-Nations losses to New Zealand while former Wallaby Brendad Cannon will apologise for labelling the coach a "clown". SANZAR will investigate comments made by De Villiers on the Rugby Club programme in Australia that appeared to suggest the All Blacks were assisted in their two recent victories over the Springboks because higher powers wanted to build up support in New Zealand ahead of the 2011 World Cup. SANZAR was on Thursday "aware of the comments, but there is no official position on them at this stage,'' an official told the Sydney Morning Herald. The governing body will determine whether the remarks, aired on Wednesday, bring the game into disrepute and if so what punishment is appropriate for De Villiers. De Villiers has also moved to calm the latest media storm by attempting to clarify his comments. "In no manner did I ever suggest that the All Blacks were being favoured - by match officials or anyone else - because their country was hosting the Rugby World Cup next year," De Villiers said in a statement. "I have stated many times during the past weeks that the All Blacks were better than us in their victories in Auckland and Wellington. Whilst I have also expressed unhappiness over some refereeing issues, this is a separate matter altogether and has no bearing on what I said. "My comment during the Rugby Club interview was based on the general view that part of the success of any World Cup event rests on the fact that the host Nation has a winning team. This view has been misinterpreted and I wish to make it clear that I had no other intention than to make that specific point. Nevertheless, I regret that this may have created the wrong impression and raised undue concern for SANZAR and the RWC 2011 organisers." Rugby Club panelist Cannon said after the pre-recorded interview was aired that De Villiers, known for his headline-making quotes, was a "clown" and that he "can't believe that senior players like John Smit and Victor Matfield allow themselves to be controlled by this guy". The programme then showed some of De Villiers' more colourful quotes from down the years. South African officials have demanded an apology from the show's broadcaster, Fox Sports, which is also an official Tri-Nations broadcaster. Cannon will apologise on air in the pre-match build-up to Saturday's Test between Australia and South Africa in Brisbane.